This is from a game earlier this summer between IM Ashwin Jayaram and GM Tigran Petrosian, where Petrosian just played 22…Qb4. Before realizing something was afoot, I had already breezed through the next few moves, so it’s hard to say what I would have done here myself. But 23.hxg5! makes a nice impression either way. 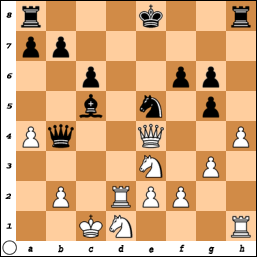 It’s not hard to see ahead to 23…Qxe4 24.Rxh8+ Bf8.